My farmer’s market fish pick this week was cod. My first intent was to make fish and chips with it, but I had a really heavy meal the day before and deep-frying wasn’t something that appealed to me at the time. Besides, I’m trying to avoid deep-frying remember? With an exception to tempura and maybe a few other choice dishes. So I opted for a baked cod. 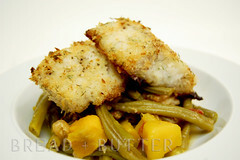 A panko and dill crusted baked cod. I had gotten a nice long fillet that I cut to fit for two. Gently removed the meaty portion from the skin and simply prepared it. If you can get cod fillets already skinned, go right ahead. Lightly coating with some extra virgin olive oil and seasoning with salt and pepper. I had some fresh dill in the fridge and finely chopped about 1-2 tablespoons that I mixed with the panko crumbs and liberally coated that mixture all around the fillets. Baked it for 15 minutes in the oven then placed it into the broiler for a few minutes to give the top an even browning. The end result was a nice tender fish that nearly falls apart in your mouth within the first bite. I served this with some sautéed string beans, tomato and squash. On a platter, mix together the panko and chopped dill. Set aside. Lightly coat the fillets with some olive oil and season both sides with some salt and pepper, then liberally coat the fillets with the panko and dill mixture. Place on a foil lines baking sheet or on a baking dish. Bake in the oven for 15 minutes, then turn on the broiler and transfer the baking sheet to give the top a browning. Do not leave more than 5 min.